The BlackBerry Hub+ Services launch on the Google Play store is performing above the Waterloo, Ont.-based mobility firm’s expectations, and BlackBerry Ltd. won’t rule out the prospect of releasing more of its custom Android software for handsets beyond those of its own manufacture. Last week BlackBerry made its Hub+ suite of software available to all Android devices supporting the most recent Android M OS. Previously, the unified inbox offered by the Hub, and flow features seen in its Calendar, Mail, and Tasks features were only available on the Priv and the new DTEK50 – devices made by BlackBerry. While the BlackBerry apps are, of course, free to users of its own hardware, other Android users only get a free 30-day trial. After that, it’s pay or view ads in exchange for continued use. While Chris House, global head of device software development at BlackBerry, wouldn’t share exact numbers on downloads seen of the Hub+ software so far, he says the company “feels good” about them and that they are “ahead of target.” He points to the glowing reviews from many users as evidence things are going well. 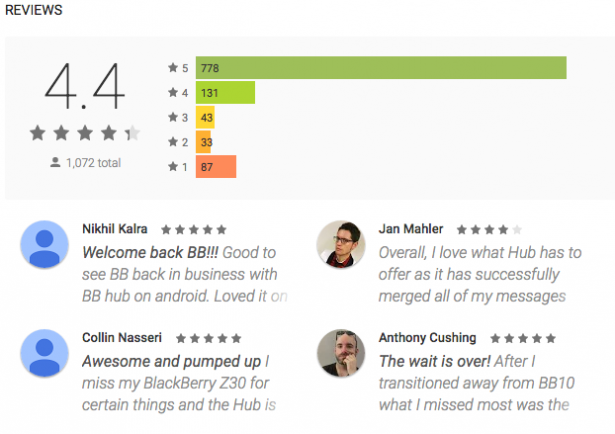 Launched just last week, BlackBerry Hub+ Services has received more than 1,000 reviews on Google Play and rates 4.4 out of 5. The app release is part of a transition away from hardware, towards a software-focused organization, House says. BlackBerry has stated that software licensing is part of its strategy to bolster a software business that is seeing revenues on the rise. Meanwhile, CEO John Chen is on the record as saying the handset business could be axed if it’s not profitable by the end of the firm’s fiscal year. Giving all Android users access to the same software on the Priv and DTEK50 eliminates at least one reason why someone might buy a BlackBerry-made Android instead of a device from Samsung or HTC, for example. But for House, there are other important points of differentiation on these devices. He says security on the Priv and DTEK50 includes hardened Linux kernel. The BlackBerry team also works to deliver all security patches released by Google to its devices at industry-leading speed. Also, the DTEK application offers additional information on what permissions apps have attained, and how they’re being used. Yet even DTEK is on the table for potentially being opened up for the entire Android eco-system. So BlackBerry is willing to consider more licensing of its software on Android in the future. It’s even aligning its own strategy with the Android roadmap laid out by Google, paying close attention to the Android for Work offerings. Industry watchers will be paying close attention to BlackBerry’s quarterly earnings reports leading up to the end of its fiscal year in February 2017. That’s when BlackBerry will know if its latest efforts in the handset business have been profitable or not. If not, it could mark a pivot point as the full organizational effort shifts to focus on software, and the days of holding a BlackBerry keyboard under your thumbs come to an end.